The Museum of Modern Art's hotly anticipated series Martin Scorsese Presents Republic Rediscovered: New Restorations from Paramount Pictures begins this week with a lineup designed to enrapture and entice! These long-unavailable titles will make their triumphant return to the big screen in handsome new restorations, the product of a years-long effort spearheaded by Martin Scorsese's Film Foundation and Paramount Studios. Unfamiliar with Republic Studios? To bring you up to speed, Screen Slate chewed the fat with Gina Telaroli, filmmaker, woman-about-town, and video archivist of Scorsese's Sikelia Productions. Her handiwork can be seen in the series trailer and its accompanying photo essay. Screen Slate: I think it's safe to assume that Screen Slate readers are familiar with the concept of "Poverty Row" in general, but they might not know where studios like Republic Pictures fit into the larger Hollywood ecosystem. For the uninitiated, can you tell us a little bit about where Republic Pictures stood in relation to other, bigger studios like MGM, Warner Brothers, and Paramount? Gina Telaroli: In 1935, Herbert J. Yates, a former Tobacco employee who was born of a bible salesman, combined six smaller poverty row studios—Monogram, Mascot, Majestic, Liberty, Chesterfield, and Invincible—and thus, Republic Pictures was born. The kind of content they produced was largely based on what the six studios had already been doing. At first there was a lot of independence and more resources for all of the players, but Yates eventually began to increase his authority, and as time went on it really started to become one studio that yielded to Yates’s vision. Monogram pulled out pretty quickly, and eventually the previous owners of the smaller studios, who had stayed on to work for Republic, pretty much all left, too. I think what sets them apart from the larger studios is possibility. Every time I watch a new Republic film, it just feels like there is a larger chance to see something different or weird or to discover something or someone new. When you’re making smaller genre films, directors can often work in new ideas or try new things, because the formula still remains intact and makes the film viable. The history of the studio is fascinating though, and for anyone who is interested, I recommend tracking down Jack Mathis’s masterwork Republic Confidential: Volume 1: The Studio , an insanely in-depth book about every possible aspect of the studio. Regardless of one’s interest in Republic, it’s an amazing book about what it takes to make movies, then or now. It might just be the best guide to filmmaking out there. Within the Poverty Row tier, Republic held a unique distinction—the quality of the films seemed to be a bit higher than the "competition," and they routinely nabbed well-known names: directors like Lewis Milestone and Frank Borzage, and actors like Myrna Loy, Joan Crawford, and John Wayne, to name a few. How did they manage to secure this kind of talent, and what do you think made Republic such an attractive studio to work for? In the 50s you started to have a lot of big stars who were starting to get older, past their Hollywood prime, acting in B movies, genre fare, etcetera. They weren't young enough for a lot of roles at the major studios, and the smaller studios and independent producers saw an opportunity to have an impressive name attached to their project. In August we’ll be screening a great Ray Milland movie called A Man Alone that he not only stars in, but it was also his first directorial effort. (He also directed Lisbon for the studio.) Beyond Republic, you had someone like Benedict Bogeaus basically building an entire output around this concept with the series of films he made with Allan Dwan, who went straight from making films at Republic to making them with Bogeaus. Other cases are a little more individual, though it often came down to Yates wanting to raise the profile of the studio beyond their serials and other standard genre fare. Borzage was likely swayed by a deal that would allow him a large amount of creative freedom, which resulted in two of his strangest and most “Borzage” films: the obsessive I’ve Always Loved You (February 10 and 14) and the bizarre Moonrise(screening in August). The Red Pony (February 4 and 12) gave Milestone another chance to work with John Steinbeck and Aaron Copland and was actually pretty early in Mitchum’s career. Likewise, when John Wayne started acting for Republic, he wasn’t the big star we know him as today. In the end, not unlike today, I think a lot of it simply came down to going where the work was, whether it was any work, or simply the opportunity to do a more specific kind of work. 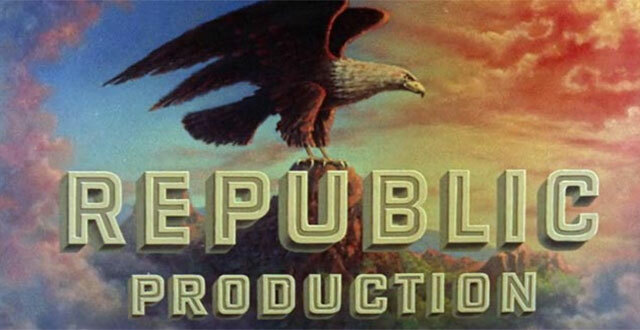 Republic Pictures was based in Studio City, and they had a ranch in Encino. (Disclosure: both of these places are in the San Fernando Valley, where I am from!). With this in mind, it's not surprising that their filmography features a wagon-load of Westerns. Other than the real estate, why do you think Republic made so many oaters? And, as an aside, how does their output in this genre stack up against the other studios—both in Hollywood proper and on Poverty Row? I've never been a good numbers person in terms of quantity, and I’m sure some wonderful person out there has already done that math, but to look at a different aspect of the word, I do think Westerns used to be a known quantity and have a kind of built in audience, which studios like Republic, who are producing small movies quickly, really rely on. What I've noticed watching so many of the Republic Westerns over the past few months is that often the Republic directors used genre to allow them to make some pretty interesting pictures. When people are wearing cowboy hats and there are gun battles, you can do a lot with the characters’ interpersonal relationships, because there's always a level of remove. You can go a little deeper and darker with explorations of human behavior, because on the surface, it’s always a fun cowboy movie with a woman who sings in a saloon, etcetera. The Plunderers(February 5 and 11) and Hellfire (February 2, 6, and 13), two of my favorites in the series, are two prime examples of this. Can you tell us about the series—how it came about, and what the process has been like restoring and programming these titles? I know it's the product of an extensive effort, spearheaded by the Film Foundation. Why dedicate the time and resources to restoring these films? What about them makes them so special? It's been a labor of love between all the parties involved: Paramount Pictures, MoMA, The Film Foundation, and, of course, Marty. Paramount owns the Republic catalog, and the work they’ve done on these preservations is nothing short of incredible. So many of these films have only been available to the public in extremely subpar conditions and mostly illegally (YouTube or taped off of television years ago), and to see these new transfers has truly been a revelation to me. I kind of can’t get over how lucky we all are to have a studio putting so much care into this kind of catalog: one of B-movies, westerns, noirs, serials, and so on. We’re also so lucky to have a film program at MoMA that remembers that films from the 30s, 40s, 50s and earlier are the very definition of modern art. So often they are cast aside as old and outdated and out of touch in the public consciousness, but in the context of art, they are extremely modern, and that is especially true of these Republic films—from the special two-strip color process they used for five years to the kind of plots the were dealing with. I think if people approached them in this context they’d be really wowed by everything that is going on in them. Then there is the heroic work of The Film Foundation and Marty. Along with their World Cinema Project, they do such tireless work to restore such a vast variety of films, from well-known classics to Edgar Ulmer rarities to things like their most recent partnership on the African Film Heritage Project to something like Juan Bustillo Oro’s Dos monjes that is currently screening in To Save And Project. And then there’s Marty. What’s so special about this series is that it isn’t just a random assortment of films or an academic look at an old Hollywood studio, but it’s a selection of films that have been a part of his life, that he has watched again and again over the years. The selection is definitely representative of the studio, but they’re also coming from the specific point of view of someone who really knows and cares about the films and that kind of filmmaking in general. There are some real treasures in the series, and I can’t wait for more people to be able to see them! BONUS QUESTION: What are you favorite titles in this series? Screen Slate readers face a glut of options on any given night, so what should our readers prioritize when staring down such a comprehensive line-up? Honestly, everything is pretty great. I know there’s a ton of stuff screening in February, so I would say just go whenever you can! But the real discoveries for me have been house director Joseph Kane’s The Plunderers (February 5 and 11) and Accused of Murder (February 5 and 7); John H. Auer’s Angel on the Amazon (February 3 and 7) and The Flame (February 3 and 6); and the religious trilogy of Driftwood (February 2 and 8), Hellfire (February 2, 6, and 13), and Stranger at My Door (February 10 and 12). Basically, all of the films I did a series of image essays on, which can be seen at http://republicpictures.tumblr.com.